I remember seeing the full moon break over the pines, spreading its beams of mysterious phosphorescence over the misty shrouds that rose from the river to the flood plain…. Many an evening I walked to and from the swimming hole as twilight gradually closed down on the day. Then, seated in front of the cottage, I could hear the water flowing over the river stones, and sometimes, just at dusk, the strident call of a whippoorwill (Tales of the Don, 19). 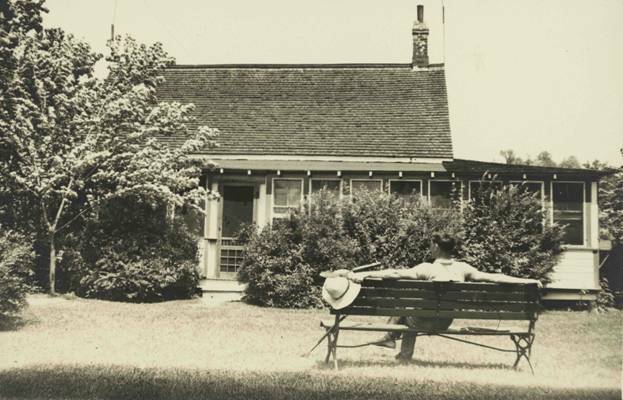 Charles Sauriol in front of the original cottage at the Forks, July 1935. City of Toronto Archives, Series 80, File 8. Sauriol spent his first summer in the valley in 1927, at the age of 24. Carrying fond memories of hiking and camping in the area from his years as a boy scout, he entered into an agreement to lease a run-down cottage near the forks of the river from the Canadian National Railway for the price of $5 a month. The cottage had been constructed in 1899 for a labourer on a neighbouring farm, and later acquired by the CNR as part of their right-of-way through the valley. With the help of his father and brothers, Sauriol immediately set to work improving the structure and its surrounding lands. Extensively cleared by early settlers in the 1830s, only four trees stood on the site in 1927. Sauriol began an ambitious project of reforestation, planting shrubs, fruit and nut trees, native hard woods and conifers on the slope surrounding the cottage (he would later carry this reforestation project to subsequent holdings in the valley). By 1938, the cottage and grounds had changed dramatically from the dilapidated structure and barren lands of 1927; Sauriol named it the “Lily of the Valley.” After many failed attempts, he finally succeeded in purchasing the land from the railway company in 1939. The deed of sale encompassed four acres of land on both sides of the river, and included a second cottage on the west side of the river that rented for $180/year. the [four] acres on the Don [turned] me into a conservationist.... My vocation of making a living was advertising, and my avocation was nature; everything that grew or moved, or had a story…. I became knowledgeable about wild flowers, birds and trees…. I became greatly attached to the Don Valley, it was in a way my life, my kingdom.... I roamed [the two valleys east and west] from end to end for all of thirty years, becoming aware of misuses…. (“Sauriol, Charles, 1932-1995,” City of Toronto Archives, Fonds 4, Series 103, File 28). Change, however, was on the horizon. In 1958 plans for the Don Valley Parkway bisected the cottage property and the Sauriols were forced to vacate the cottage. It was demolished the same year. Rather than leave the valley entirely, however, Sauriol and his family moved across the Forks to the former Degrassi homestead on the East Don. Their time in the valley, however, was almost up. Widespread damage caused by Hurricane Hazel in 1954 gave new urgency to flood control measures, and the newly formed Metropolitan Toronto and Region Conservation Authority (MTRCA) wanted to remove houses from risky floodplain areas. In 1968, the Sauriols were expropriated for a second time, and this time they left the valley for good, reconstructing their summer home on a property near Tweed, Ontario. In his time on the Don, Sauriol had seen the valley change from a picturesque setting of rural farms and woodlands to an increasingly threatened corridor of urban green space. Sauriol, Charles. Tales of the Don. Toronto: Natural Heritage/Natural History, 1984. ---. Remembering the Don: A Rare Record of Earlier Times within the Don River Valley. Toronto: Consolidated Amethyst Communications, 1981. ---. “Sauriol, Charles, 1932-1995.” City of Toronto Archives, Fonds 4, Series 103, File 28.